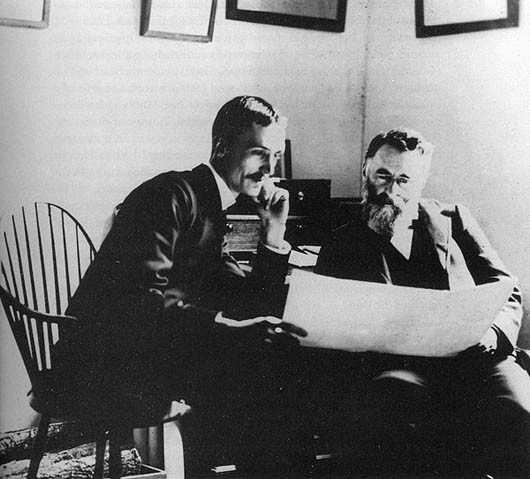 Frederic Ward Putnam (right), Curator of the Peabody Museum at Harvard University from 1874 to 1909 (and Honorary Director thereafter until his death in 1975), provided valuable leadership to both the scientific and anthropological communities of the nation. He served on every committee to promote antiquities legislation from 1900 through 1906, For many years he offered the only doctoral training in archaeology in the country. He is shown here consulting with one of his earliest students, George Byron Gordon (left) a Maya specialist who later became directory of the University Museum in Philadelphia.